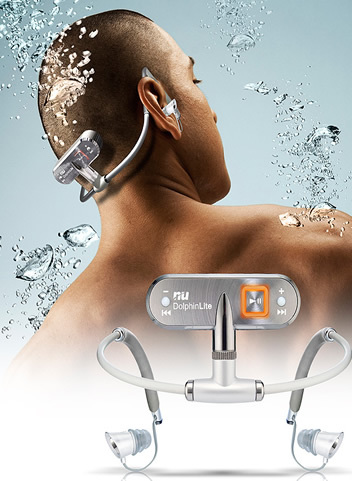 The NU Dolphin Lite waterproof MP3 player and waterproof headphones are fully submersible in water. 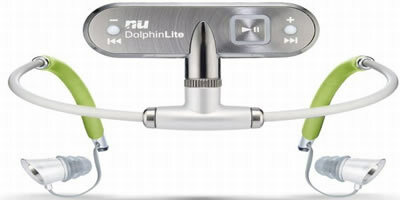 The NU Dolphin Lite is designed to be worn without swimming goggles. It is great choice for triathlons. Although the Nu Dolphin Lite waterproof mp3 player is designed for watersports the product can be used for out of water activities with the accessories provided. The design is made with ease of use in mind. A detachable base unit connects to the headset. You can start, stop and skip tracks by using three buttons on the base unit, these are generously sized so you are not left searching for the different functions. The Nu Dolphin Lite waterproof MP3 player offers a 2GByte memory with some great features. If you are in a rush to the gym, run, cycle or swim just quick 5 minute charge will give you a whopping 2hr playback. The waterproof earphones use best design soft silicon christmas tree type barb earplugs that fit firmly in the ears and prevent the earphones from coming loose during vigorous activities like swimming, surfing, etc.